You may recall from my bolero inspiration post that I had to change my original knitting plans as my shoulder hasn’t been allowing me to knit stranded projects. 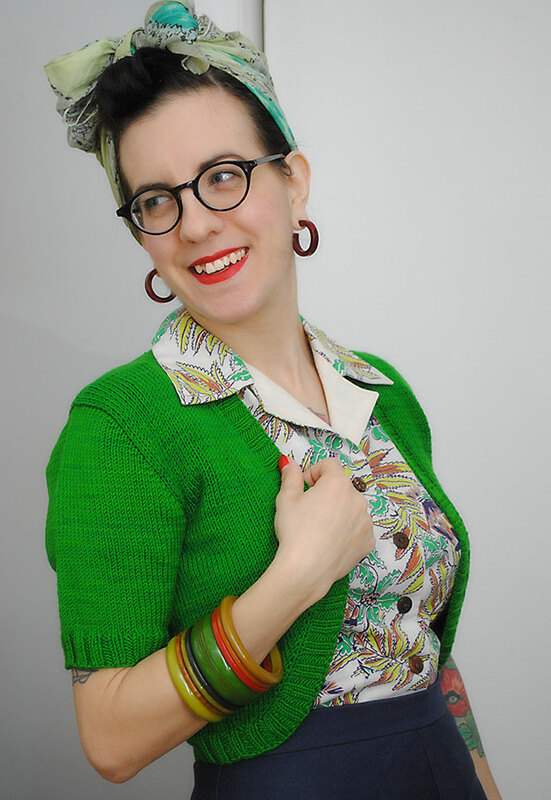 So I designed something I really wanted in my wardrobe: a little green bolero. You’ll see it’s very simple! 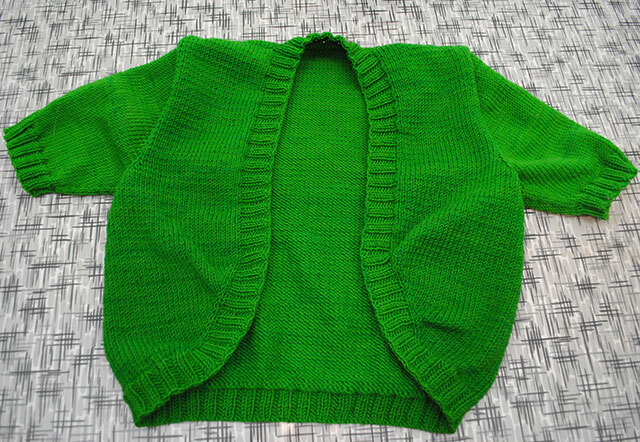 As I explained in the bolero inspiration post, I started off knitting this with two strands of DK-weight yarn to achieve bulky weight and used a moss stitch pattern, but close to the end I decided it was going to be too big. And thus re-started, nixed the moss stitch and kept it a single strand of yarn. There’s really not much to say about this knit, other than it’s a great basic! Originally I was thinking about adding some felt appliqué, and then later just ordered a brooch to wear with it, but it didn’t arrive in time so I went without any adornment. It’s colorful enough, I think that suits it just fine! 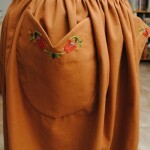 The set-in sleeves were knit from the top down, and the body was knit in the round to the armholes. The scooped shaping on the front was achieved by casting on the number of stitches I wanted for the back plus much less for each front, and gradually increasing up to the full number of stitches I wanted for the bust to have a few inches of negative ease (since this is obviously not meant to close). There was no side shaping. 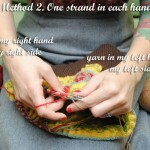 I didn’t write a pattern but I have notes on most of what I did on my Ravelry project page. I’m so glad I frogged the first almost-finished version of this and knit it again. I don’t do that a lot, but when I really want something to be just right, it’s worth it. 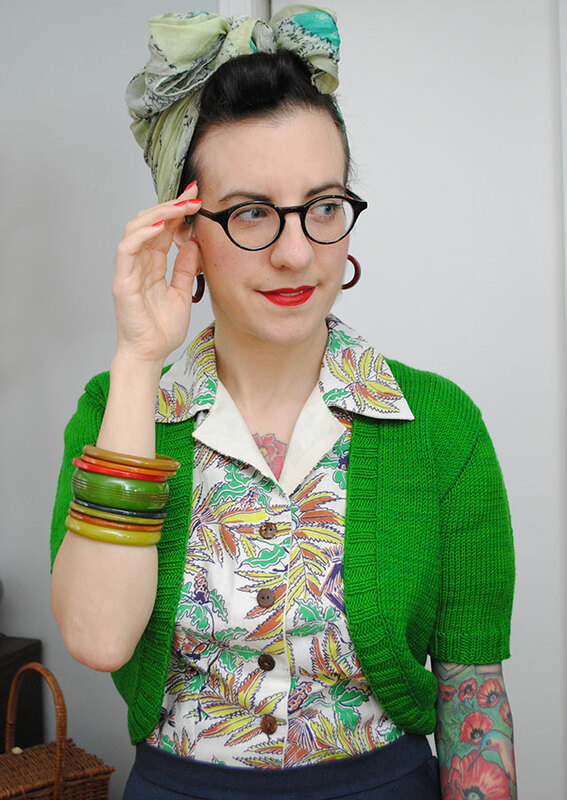 Why invest so many hours knitting something, only to have it live in the back of the closet? 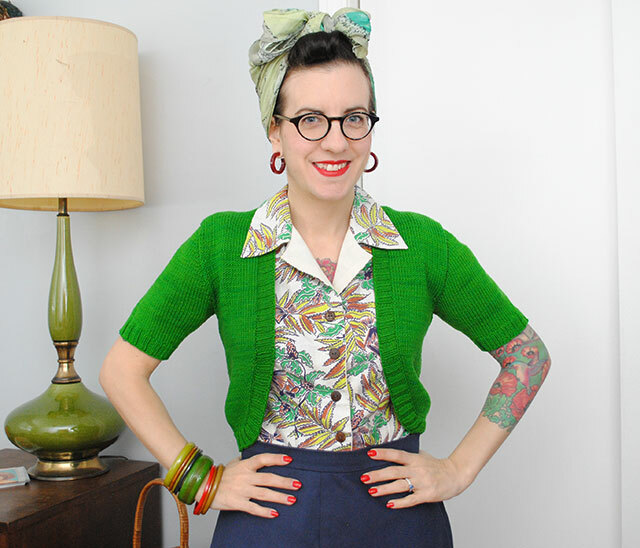 I think it’s the perfect outfit to show off this snappy little bolero! Boleros are perfect when you just need a light knit or want to cover up a little bit. Sure, I won’t actually get to wear this for a few more months due to winter, but a girl can dream, right?? I sure think of this as a victory. I might need another one or two in different colors, too! It’s beautiful!! That green is stunning. Can’t wait to see the new haircut, too! Absolutely perfect 🙂 and there are some gorgeous knits on the flickr group, too! Thanks! And aren’t there a ton of beautiful projects in the Flickr group?? Very inspiring! So cute! Can’t wait to see your new haircut! I love everything about this – the shape, the stitch and the colour – it looks lovely. 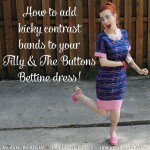 Your styling is spot on – the blouse is a great contrast to the lovely bright green. A drastic haircut? Looking forward to seeing your hair and your other projects. Man that turned out great! What brand of yarn is that? What a beautiful shade! Thanks! It’s Wollmeise DK, a German hand-dyed yarn. Very cute! I love boleros (or shrugs as I sometimes call them) for wearing around the house if I’m a bit chilly. The short sleeves and cropped sort of cut-away waist means I don’t drag my lovely knitwear through the onions I’m chopping! I have several of them. But now you make me want one in green! This is a perfect little bolero for pairing with dresses and skirts! You’ve styled this whole outfit wonderfully! Also, your pictures are amazing! Did Mel take them? If so, let her know how great a job she did with the lighting and exposure! 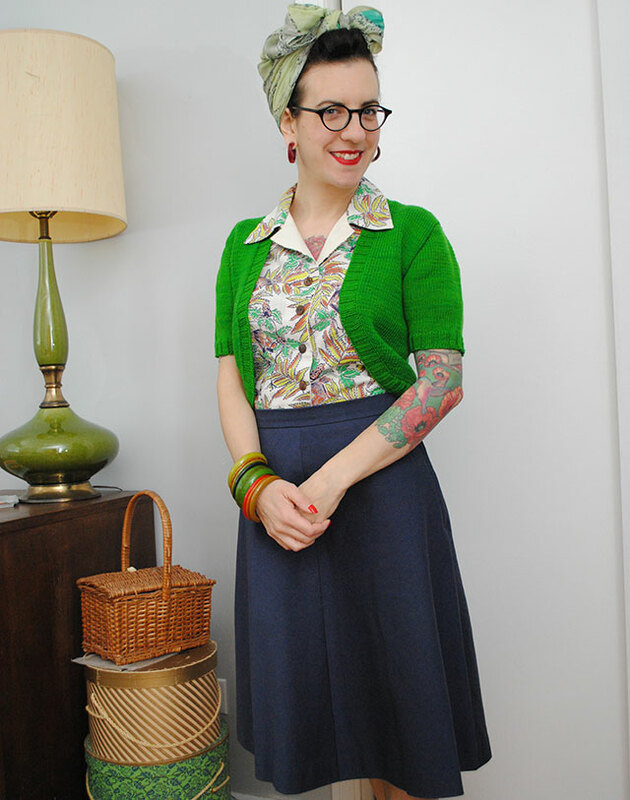 Truly, it’s hard to actually get up the gumption to knit it all again but I’m so glad I did! I need to photograph my headband asap! How sad is it that I just got my hair cut and um, STILL haven’t done anything with it?! lol I can’t wait to see your new hair!!! Just beautiful, I’m GREEN with envy over here. Wow…I love it! The colour is awesome! Lovely little bolero! That colour suits you so well and combined with your blouse makes the outfit so fresh. I looked at the flickr pool and WOW, so many talented knitters. I would take any of those knits in my closet in a blink! I agree Cherise, there’s so many beautiful knits in the pool! It’s lovely! And so cheerful! 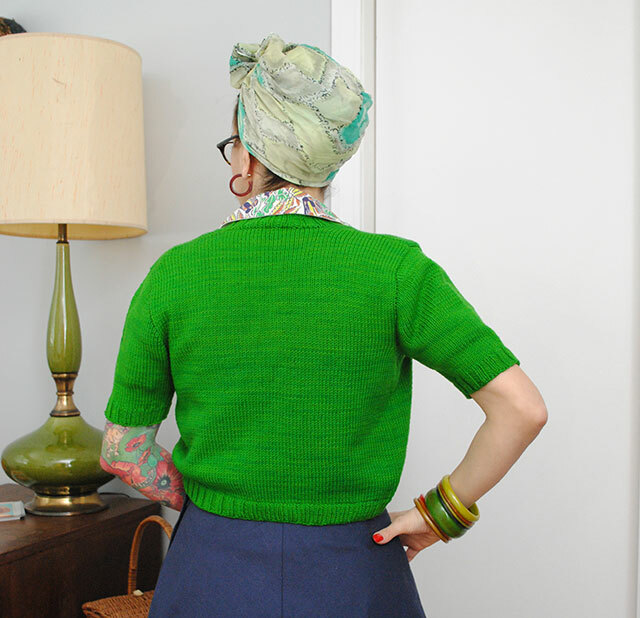 This is the most perfect little bolero, and I think I have just the right yarn to shamelessly copy you! So I’m very happy that you shared your project notes with us! 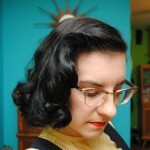 Would it be alright for me to use one of the pictures in this post on my blog? I will of course credit you as creator and link it to this post. 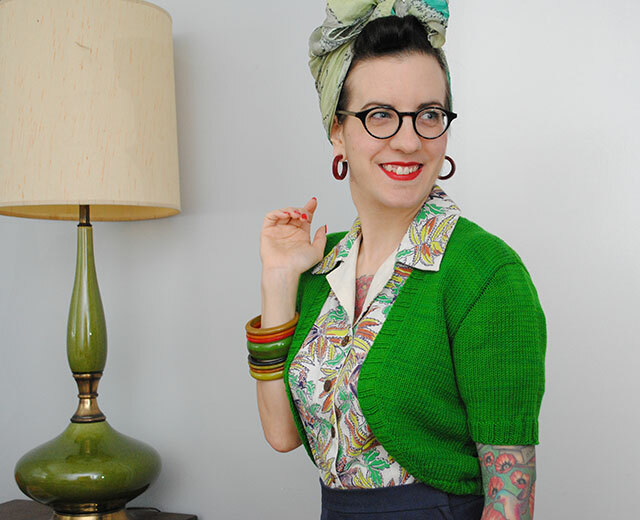 (I’ll be talking about knitting inspiration). I love this color! You’re killin’ it in this look! What a wonderful shade of green! I also adore your whole ensemble here! The green is just absolutely delicious, and it looks like it will be such a useful wardrobe addition. Thanks Kerry, I think it will be too! I’d like to do a long sleeved version sometime too, to make it transition into winter. This is lovely. I am really impressed that you made up your pattern, that is really skillful. Egads! Look at that nifty little bolero; it looks amazing! I absolutely adore that shade of green too; it just pops. 🙂 Great job on it! Also, I can’t wait to see your new haircut. I bet you will look fabulous! (Then again, you always seem to.) I love the styling and thank you for sharing the project notes! It is a thing of complete and total verdant beauty!!! Fabulous shape, length, and colour. A green that punchy also seems like such a great note to help try and usher springs’s early return in with. Awesome job, dear Tasha! You and your new bolero look fantastic! So cute, I love the color, this green is fantastic !!!!! Would you ever consider releasing this as a pattern? Because if you did I would buy it!! !